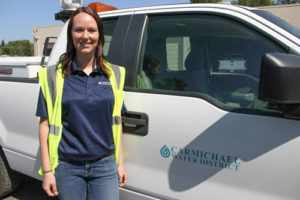 Carmichael Water District field employees rarely have to disturb the homeowner when they go to a site. And often are on site after the homeowner calls about a problem or leak. District field employees wear shirts with the Carmichael Water District name and logo. They also carry District employee ID badges with the employees’ name and photo. In addition, all District vehicles have the District name and logo on the doors. and if you feel uneasy please contact the District’s office for verification at (916) 483-2452.